For other people named John Saunders, see John Saunders (disambiguation). 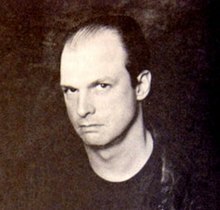 John Baker Saunders, Jr. (September 23, 1954 – January 15, 1999) was a founding member and bassist for the American grunge rock supergroup Mad Season, as well as a member of The Walkabouts. He was born on September 23, 1954 in Montgomery, Alabama to John Baker Saunders, Sr. and Charleen I. Greer. He attended North Shore Country Day School, Rye Country Day School, Fay School, New Trier High School (East), Cabrillo College and Providence College. Saunders began his career as a blues bassist, working with traditional blues artists in Chicago, such as Hubert Sumlin and Sammy Fender. He recorded and toured Europe with the Seattle-based band, The Walkabouts. Saunders also worked with The Lamont Cranston Band, in Minneapolis. In 1994, Saunders went into a Minneapolis drug rehabilitation facility, where he met Pearl Jam's Mike McCready. After completing treatment, Saunders and McCready returned to Seattle and formed a band called The Gacy Bunch, with vocalist Layne Staley of Alice in Chains and drummer Barrett Martin. They soon changed the band's name to Mad Season. Mad Season's acclaimed album, Above, released in 1995, was awarded a gold record for sales in the United States. It was the only album that Mad Season would record. In 1997, when Mad Season vocalist Layne Staley left the band, the remaining members tried to revive the band by finding a new singer. Saunders had a relapse with heroin and died on January 15, 1999 from an overdose. In 2002, Mad Season vocalist Layne Staley would also die of an overdose, leaving Barrett Martin and Mike McCready as the only members of Mad Season still alive. ^ "Mad Season Bassist Baker Saunders Dies". Mtv.com. 1999-01-19. Retrieved 2011-07-21. ^ Orshoski, Wes (May 4, 2002). "Staley Mourned as Heroin Casualty". Billboard. Retrieved July 23, 2010.